In my Sacred Unplanning work, I lead women through a process of anchoring deeply into their Soul Purpose. We create a powerful statement that reminds them who they are and what gifts they’re here to share with the rest of the world. The next thing I suggest is to make something VISIBLE and TANGIBLE that connects them to that purpose. And one of the easiest ways to do that is by grabbing a stack of magazines, scissors, some glue or double stick tape, and a poster board to make a radiant, soulful collage. I've been making Vision Boards for over 15 years and have become utterly devoted to this SURPRISINGLY simple spiritual practice. I fell deeply in love with this process and was completely hooked. I was living on the Big Island of Hawaii and was invited to a Vision Board Party at my friends house with piles of magazines and we started clipping away. This is what I want for you, too, as a result of making your Vision Board. To feel clear and confident about what you DEEPLY, TRULY DESIRE and then allow it to show up in your life. 1 :: Visualization is a truly powerful tool for creating new results in your life. It’s even used in sports to help athletes achieve amazing feats of strength and skill. Every time you look at your Vision Board, you’re essentially doing a mini-visualization of what you want your life to look and feel like. 2 :: A Vision Board creates sacred space, just like a spiritual altar. It focuses your energy like a beam of light, helping you to intensify your connection to your desires. 3 :: Vision Boards infuse a spirit of fun, playfulness, and imagination that lead you to new solutions and inspiration as you pursue a life of purpose, meaning, and powerful self-expression. 4 :: The act of creating the Vision Board allows you to experience what it’s like to feel totally FREE to explore any and all possibilities for you and your life. And then gathering together vibrant, inspiring images and words that will help you stay rooted in your vision so it can blossom more quickly and powerfully. WHY TAKE A VISION BOARD WORKSHOP with me? I adore teaching, facilitating, and creating the sacred time and space for you to go deep within and unearth the treasures of wisdom, insight, and guidance that can feel so elusive when we don't make time to connect to ourselves. 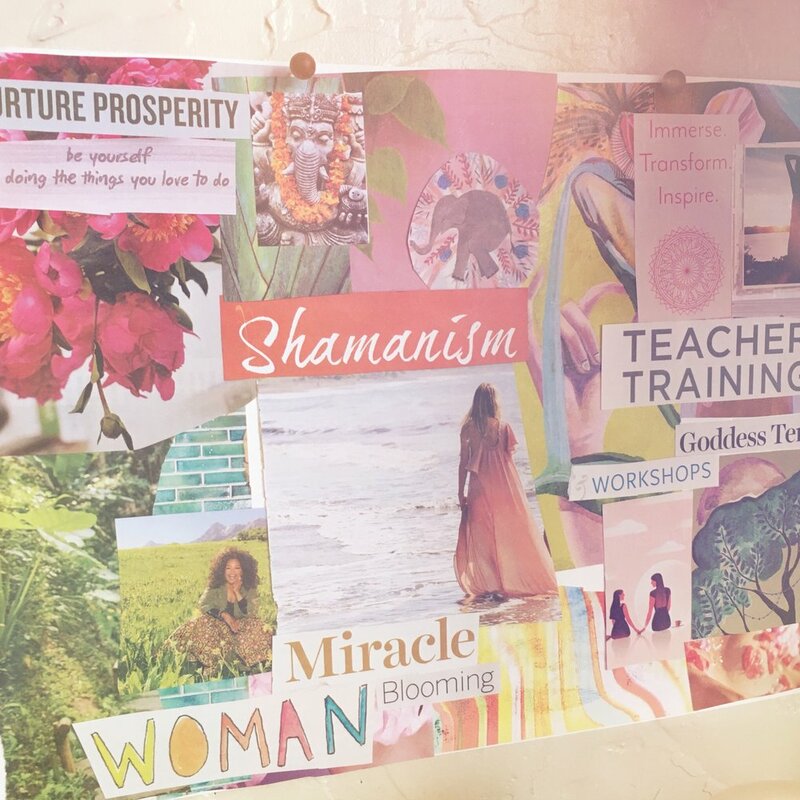 What I'm offering in the Radiant Soul Vision Board workshop is my unique toolbox of the insights, shortcuts, inspiration, and techniques to take your vision board way beyond a collage of 'stuff' you think will make you happy. These are the lessons I've learned from 15 years of making sacred, soulful, and inspiring Vision Boards for my personal practice. The knowledge I'm sharing in this workshop is a sacred experience designed to help you make a powerful, energetically aligned, and radiant board that reflects your INNER TRUTH. There's a vitally important secret about Vision Boards that most people don’t talk about, and that is the power of PLAY and JOY. Carving out time to do something for the pure, playful enjoyment of it triggers all sorts of lovely reactions in our brains. You access the part of you that feels an expanded sense of possibility. You generate inspired solutions to problems you just can’t think your way out of. Your heart rate slows down and you start to tap into a synchronicity of universal energy. If you’re standing on the fence trying to decide whether this workshop is right for you, I invite you to imagine a bright, bursting rainbow of light shining from inside your heart…and know that your inner creatrix and soul-spirit is shouting out loud at the idea that you’re going to LET HER PLAY! A workbook of insightful prompts to help you feel, see, and clearly identify your heart and soul’s most radiant desires. The simple, easy to find list of supplies you need to have on hand to make your Vision Board, along with my comprehensive list of resources for incredible visual images. What do I need to participate in this workshop? All your content will be presented on a private website that you can work through at your own pace including a mix of PDF files and videos. The supplies list for making the vision board is included and the suggested items are generally affordable and easy to find either online or at a local retailer or art supply shop. Do I get lifetime access to this content? Yes! You’ll be able to keep the emails download all the resources offered during the class to save on your own computer. What if I register and change my mind or don't like the workshop? Can I get a refund?